Sometimes, simpler is better. Most of the recipes I use tend to end up there. It’s really strange, but for some reason, the recipes with fewer ingredients are the ones that taste the best! 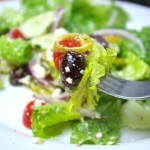 This Greek Salad Dressing recipe is one such case! Was just used again last night with Chicken Souvlaki, and was more than well-received. I’m pretty sure you’ll love it, too! Combine ingredients in a dressing shaker, shake vigorously, and enjoy! You can enjoy right away, but if you let the dressing sit for a while it will allow the flavors to combine deliciously!